If you enjoy this kind of article, why not stay in touch by filling out the form below. Everyone who subscribes receives a free ebook on the craft of writing, lists of publishers for short and long fantasy fiction, two free short stories, and a list of book reviewers. I usually send a newsletter once a week with links to articles I think may be of interest too. The world in which a story is set is important to any tale, particularly when it comes to fantasy. We read these kinds of stories to escape to new and unexplored worlds filled with possibilities, mysteries, and oddities. This article will explore a few tools to help build a world and then looks at approaches to revealing it in your story. How do you build an entire world? It’s easy to become caught up in the world-building process. For some, it consumes all of their attention, to the extent that they do a Tolkien and for years do nothing but detail everything down to the smells of each flower. For others the world is a stage upon which the story takes place, revealing merely what exists around the characters. Generally, a story takes place either in the world we know, or an entirely fictitious world, sometimes known as a ‘second world fantasy.’ As the focus here is on fantasy, it’s the creation of the latter we’ll predominantly explore. Author Brandon Sanderson has his own approach to world-building which focuses on two things: physical setting and cultural setting. Physical setting encompasses the things that exist if humans—or whatever species your character is—did not exist. So, for example, geography, flora, fauna, weather, cosmology, geology, laws of physics. In one of Sanderson’s own books, Mistborn: The Final Empire, the world is plagued by ash falls and dense mists which descend each night. Consider too Terry Pratchett and his Discworld books, which involves a world constructed on the back of a giant turtle floating through space. If you’re struggling to think of things, try to remove yourself from your physical world. What if the sky was green and the leaves of the trees blue? This covers things influenced by man, or things that can be physically manipulated or changed, such as laws, politics, religion, government, language, structures, landmarks, philosophies, foods, music, fashion, folklore, weapons, technology, clothing, histories, rights, jobs, medicines … the list could go on. It would be impossible to write a book of readable length if you covered every one of these things, and these are but a handful. The trick is to pick a few of them and explore those in detail, perhaps bringing in other related settings in less detail. George R.R. Martin is an expert when it comes to this. He writes his own songs and poems, goes into great detail about the food the characters eat, like the ‘bowl of brown’ in Flea Bottom. Some of his most iconic scenes are those at feasts and balls with vivid descriptions of songs and meals. If you can, seek conflicts between the different cultural settings you choose to explore. This will liven up the story and create original angles. It cannot be understated how crucial creating conflict is, and if you can intertwine conflict with your world-building you’re on the right path. Having a character that cares passionately about a setting also provides a vehicle for revealing much about it, such as a character that loves to cook, like Talon in Feist’s Riftwar Cycle. Again, have fun with cultural settings. Let your mind run free. Remove the shackles of reality. Anything is possible in a world of your own creation. Drawing a map of your world, continent, region or city is a good way to help build up a world from scratch. Places will be grounded in your mind, giving you a more authoritative voice when you speak about them. It allows you to add crucial specificity, something that will enhance your story no end. One way to help conjure a world is to ask yourself questions: who, what, where, when, how. What type of magic exists in the world? How does someone gain the power to use it? Are there different kinds of abilities and spells? Is there a limit to how much magic one person can use? Such questions are invaluable. And don’t settle for the first thing that pops into your head. Push yourself to think of different options and possibilities. Keep asking ‘what if?’ And if you can’t think of an answer, worry not. Move on. Your subconscious will be working away on that, and one day the answer will, with a bit of luck, come to you. One of the best ways to come up with ideas for your world is to get out into the real world and explore. There’s nothing more powerful than actually seeing rolling mountains, walking through forests and fields or busy city streets, hearing the noises of factories, the smells of the beach or a harbour. It allows you to write with experience. As you wander think of your own world. What twists could you put on things? Research is important to gain a greater understanding of how something works. If rivers form a big part of your story, learn how they work, the different types of river, how tributaries and meanders are formed, and so on. Again this gives your voice more authority and gives you the tools to describe things with confidence and conviction. If you’re feeling impatient and don’t fancy doing any of the above things, by all means, build as you go along. Write your story, see where it takes you. You may reach a point where your character needs to go to a new city. You can then ask yourself questions. What kind of city is this? A thriving metropolis or a besieged ruin? What’s the population size? What’s the economy built upon? The downside with this approach is you’ll probably have to revert to make sure it works, to ensure consistency and to fill in any gaps. How do you reveal your world? So you have your world, how do you reveal it to your reader? The philosophy of the iceberg is to reveal a little of your world to the reader while holding back much more. Similar to the way with an iceberg we see only the tip, while beneath lingers much more. Show the reader the view through the keyhole, make them want to beat down that door and see everything else. So how do you achieve this? By dropping hints. Show a little, then a little more, gradually removing the shroud surrounding your world. Another way you can gradually reveal more of the world is to have characters discuss things. So, for example, the way orcs and goblins exist in Middle Earth. It’s the way things be. Using specificity in such instances is a great way to add to the effectiveness. Another way to reveal details is to have a character that’s unfamiliar with the world around them. New sights, smells, sounds. They’re exploring with the reader, and then you can reveal the glorious details you long to share, like how each and every bloody flower smells. Don’t info dump! By this, I mean spewing onto the page every little detail that pops into your head. We’re all guilty of it. Much of the background information you include must be relevant to the story, though the odd little detour can work well. The reader doesn’t want to know the history of a city’s sewage system unless it’s pertinent to the tale. Watch out for repetition. When revealing a world it can be easy to labour points or refer to things more than once. Constant editing and critiques from trusted sources can help fix this. One temptation is the feeling of wanting to ground the reader in your world from the off. First, the reader must know all about the lore of the land. Only then will they understand the plight of my assassin priest hero. Bad idea. And don’t use a prologue to set out a hundred years of history. The best way, according to Sanderson, is to be sparse with detail during the first few chapters, keeping the focus on the characters and generating empathy toward them. Reward the reader with little details as you go along, and later on, when everyone’s comfortable and engaged, open the door. This is something I came across. A great example of the depth some worlds can have. A webinar on world-building with the editor of ‘The Martian’, Michael Rowley. If you enjoyed it, why not stay in touch by filling out the form below. Everyone who subscribes receives a free ebook on the craft of writing, lists of publishers for short and long fantasy fiction, two free short stories, and a list of book reviewers. I usually send a newsletter once a week with links to articles I think may be of interest too. Reblogged this on Richie Billing. Thanks Ana! Glad you found it useful! 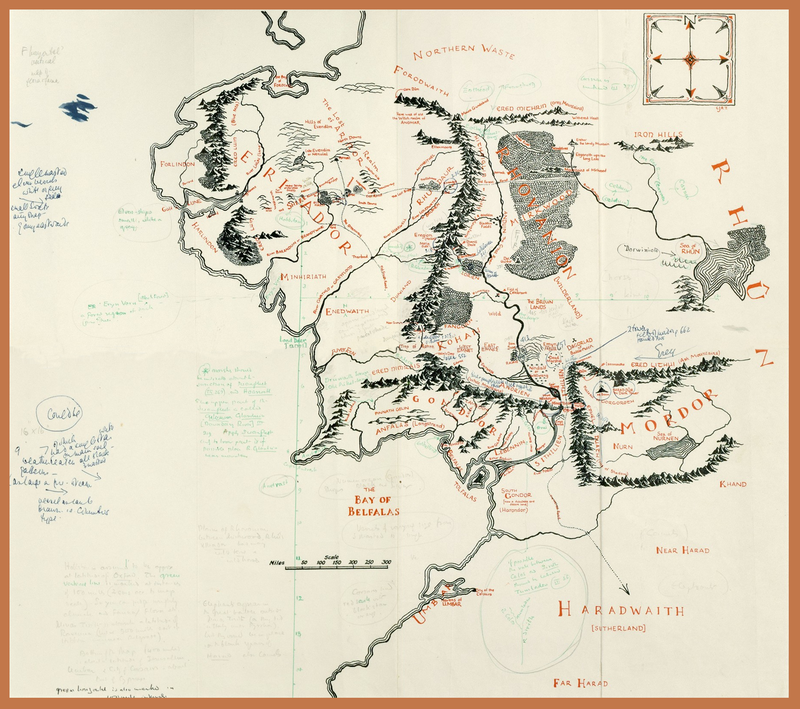 Blackwell Rare Book’s offered a “newly discovered Middle Earth map annotated by Tolkien.” Unfortunately, they’d cut the photo in to four pieces (digitally). They did offer a scale reduced version. This version has taken the higher rez pieces and stitched them together. Hi there. This is awesome. Thank you for sharing! I love a good map! I totally agree with Sanderson about focusing on the characters at first. Too many authors try to wedge in all their world-building at the beginning. Thanks for the post, especially the included links. A lot of helpful information here. Thanks! You’re very welcome! Thank you for reading and commenting!